Everything. If you do not have time for the larger Keith Richards biography “LIfe” then this easy to use, handy, self-help guide – “Daily Affirmations From a Rock and Roll Survivor” – is exactly the kind of fix your life might need – cheap and fast! We had a quick flick through “Life” – amazingly there were no completely blacked-out chapters in the middle…anyway, here’s the lazy man’s guide to all things Keith. They say that life will give you the face you deserve – clearly Keith has been doing a lot of a lot of heavy, hard and fast living – plenty of character building stuff; hi-jinks, a few scrapes with the law here and there – close calls! But what’s not to learn or love about a man who snorted his dead father’s ashes and dresses like a street walking panther. More importantly this book gives you the wisdom of his experience without the drama, the drug busts, the house fires, the excommunication from the UK and the face that goes with it. No wonder he is still here – after making it this far – why stop? 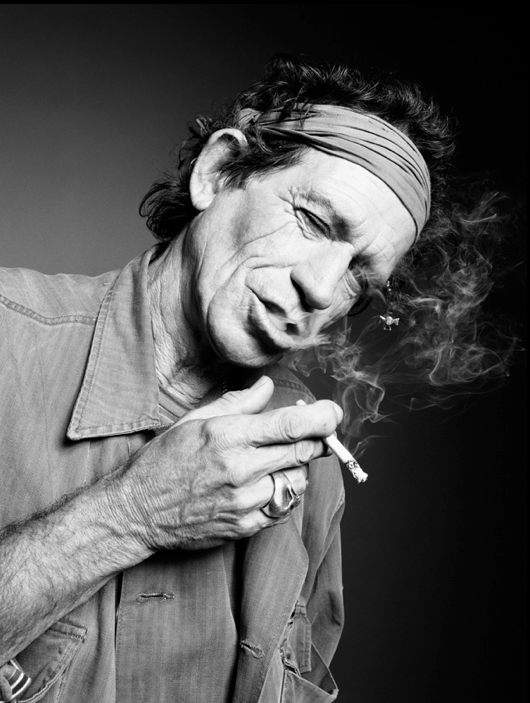 And, the truth is that Keith Richards is actually too smart to die – he just doesn’t use moisturiser. When a teenage boy shoots himself with a revolver, okay, if he does it while in bed with your lady, well you had better be mentally prepared. Aside from being stuffed with a miasma of wonderful quotations and spoken amusements from the man himself Jessica Pallington West has adroitly built an entire system of belief around the biography, events, musings, mishaps and misadventures of Keith Richards. From shy, nervous teenager, to his beginnings in Rock ‘n’ Roll and all the way through to his years as a”laboratory” – it’s all here – the fast track to greatness, distilled – from Rock ‘n’ Roll’s most gnarly guitar icon, pirate and elegant waster. Even though the SELF HELP side of the book is somewhat “tongue in cheek” the salty, gritty wisdom that the author expounds is, in fact, some of the best advice you’ll ever receive. 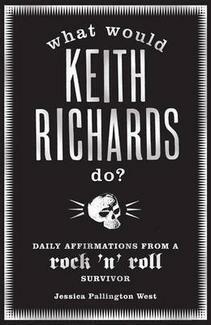 Richards’ 50 year rock and roll rollercoaster ride ensured that, having pretty much seen and done it all, and survived to tell the tale, he had to develop a unique philosophy, a zen-like armoury of trinkets, talismans and some rather unique thinking. More importantly the family recipe for Shepherds Pie with the power to ward off the devil, comes free with every copy. This book is about as much ‘Keith Richards’ fun as you can have without the heavy consequences. It is utterly hilarious. The secret to living forever is something to do with cheese.